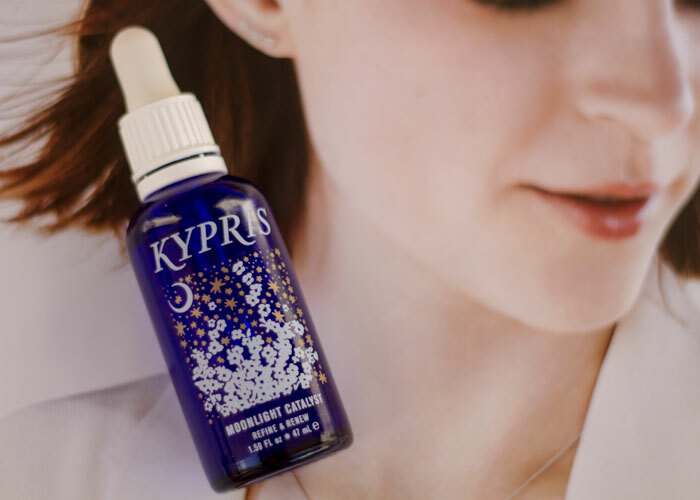 That sentence — the first line on the back of KYPRIS’ Moonlight Catalyst serum — enchants me every time I read it. Besides the beautiful language and imagery it evokes, it’s a reminder of how our evening skincare routine can inspire powerful changes and healing in our skin. That’s especially true if you’re using an evening skincare serum that’s an herbal replacement for retinoids and alpha hydroxy acids. During rest, our bodies and skin renew and repair itself, prepping for the next day of mental, physical and environmental stress. Our daytime skincare regimens should focus on antioxidant-boosting, sun-shielding ingredients that help our skin dodge free radicals and stay as healthy as possible when faced with the elements. At night, it’s all about restoring what was robbed from us and starting fresh. That’s what I feel like my skin experiences when I use Moonlight Catalyst (a favorite for something like six months now!). In the evening, after washing and toning, I follow the KYPRIS emulsion routine of combining 4-5 drops of Moonlight Catalyst serum with 3-4 drops of my facial oil of choice (I will dare to say that Beauty Elixir II is my favorite facial oil on the market) and, if necessary, an additional booster, such as the Clearing Serum or other targeted treatment. The gel texture of Moonlight Catalyst allows all of these serums and oils to combine beautifully for a silky, slippery emulsion that slides onto the skin and dries to a perfect, moisturizing finish. Your skin never feels heavy, oily or tacky — just perfectly quenched and ready for rest. After a good night’s sleep, I wake up to find my skin looking the way KYPRIS Moonlight Catalyst promises: Refined and renewed. I don’t know how else to explain the look of beautifully resurfaced skin that has fewer visible pores and a smooth appearance. It’s as though my face has a Photoshop skin blur effect. That’s thanks to the herbal cocktail makes KYPRIS Moonlight Catalyst so special. This so-called “skin blur” is the smoothing-texture effect that many achieve with prescription retinoids — but without the irritation thanks to KYPRIS’ smart formulations that include a combination of fermented pumpkin enzymes, biomimetic epidermal growth factor (EGF), and hydrating botanical extracts. Fermented pumpkin enzymes help soften the skin and decrease the appearance of inflammation and discoloration. It’s these enzymes that trigger deep yet gentle exfoliation that result in a refined texture. Biometric epidermal growth factor is a new addition to the recently reformulated KYPRIS Moonlight Catalyst. This peptide was added to help mimic the renewing benefits of your skin’s naturally occurring EGF. In addition, Moonlight Catalyst’s updated formula includes a new peach extract that has higher hydration properties as well as organic neroli flower extract which helps soothe both the mind and the skin during application. Besides the high-tech ingredients mentioned above, we have to acknowledge the inclusion of some of our favorite familiar skincare ingredients. Think rosehip flower extract, sea buckthorn extract, plum fruit extract and willow bark extract. These aid in the delivery of essential fatty acids and hydration as well as the acne-prevention that we all hope for in an evening serum. I’ve tried both the original formula and this new formula, and I will say that while I had wonderful, refining results with the original formula, I have indeed noticed that the new formulation has even greater results — mostly in the speed in which you see cell turnover and renewal. With my first run at KYPRIS Moonlight Catalyst’s original formula, I could tell the difference in my skin’s texture within three weeks. With this new formulation (and mind you, with breaks in between to test other nighttime skin serums), I saw texture improvements within something more like 10 days. That said, you should always test new products 1) as a patch test or sample first and then 2) give them a good, solid month to truly have a full effect, at least. KYPRIS Moonlight Catalyst is a repurchase for me and an absolute recommendation. 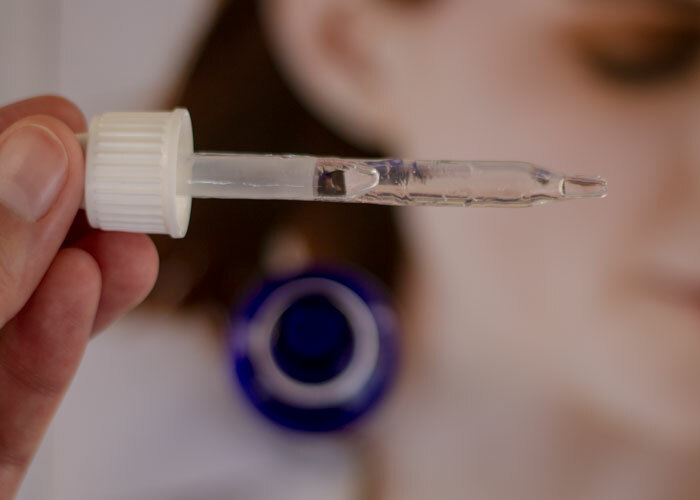 It’s one of the better-priced evening serums available, too — $72 for a HUGE 1.59-ounce dropper bottle — and many retailers offer samples if you’re still experimenting. Get Moonlight Catalyst at BeauTeaBar, Credo Beauty, The Detox Market, Integrity Botanicals and Spirit Beauty Lounge. What evening skincare treatments do you use? Have you tried Moonlight Catalyst or anything else from KYPRIS? Tell me in the comments section!